Elbow through your tape collection. These days cassette tapes are regarded in a similar way that vinyl was about ten years ago; the only true way to listen to music. As reported on earlier in the year, cassettes are actually making something of a come-back, with an increasing number of artists releasing their music on tapes. But... what are you going to listen to those tape on? The answer is the innovative Elbow. 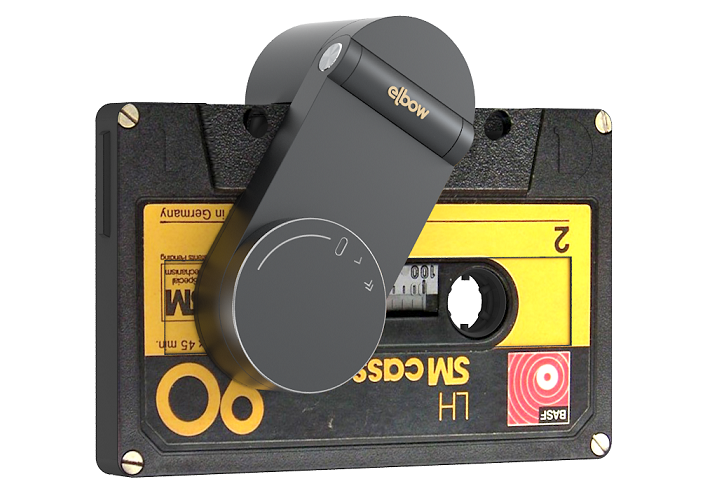 Elbow is a small pocket-friendly device that attaches directly onto a cassette tape and allows you to plug in a pair of headphones. The battery-powered Elbow then turns the spools of the tape while also scanning the magnetic strip. 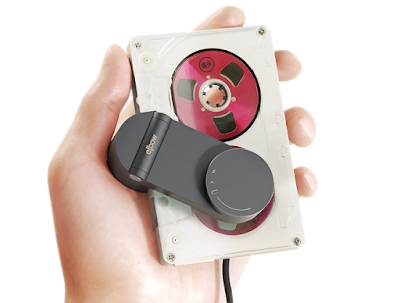 Its like a completely stripped-down Walkman, but it folds up to fit in your pocket. Elbow is so small that it can be pinned to your clothes to be worn, turning it, and the tape, into a sort of fashion item. Which is pretty cool and sooooo 80s. If you're a dedicated tape-listener then this could reduce the amount of bulk you have to carry around in your bag on a trip, or on the daily commute.